Another beautiful fall weekend means more soup cooking in my kitchen. 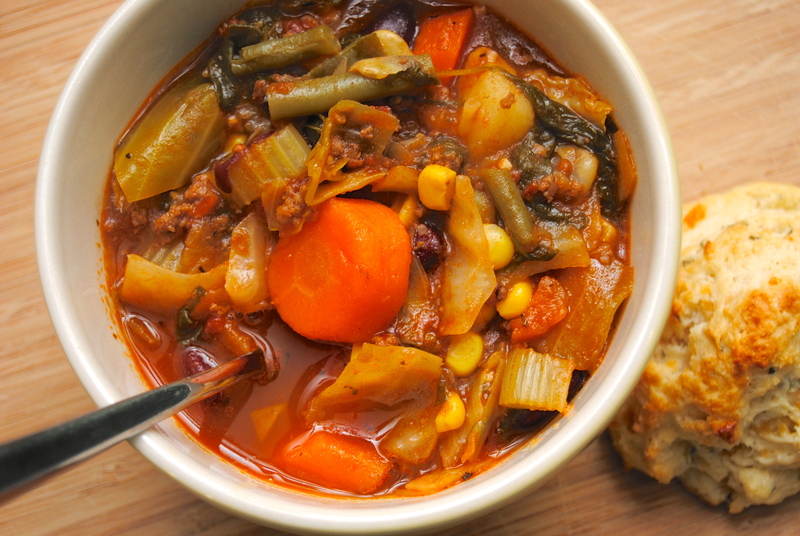 Vegetable soup is one of my all-time favorites… my mom used to make it for me when I was growing up. 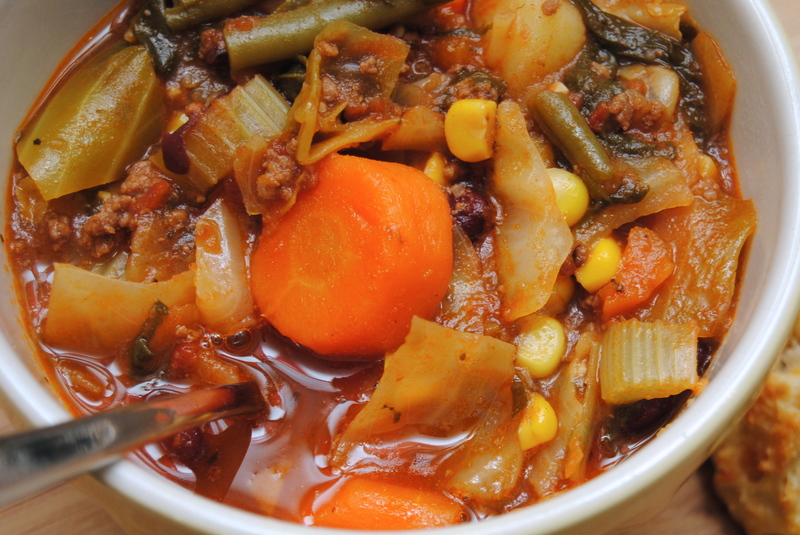 And by the way, vegetable soup to me means beef vegetable soup because that’s just how I roll. I used my fav organic ground beef from Costco, lots and lots of fresh veggies, a box of tomatoes and only used cans for the beans. Depending on what I have on hand sometimes I vary the vegetables (zucchini is good in this too), but the one thing that I must have is the cabbage. 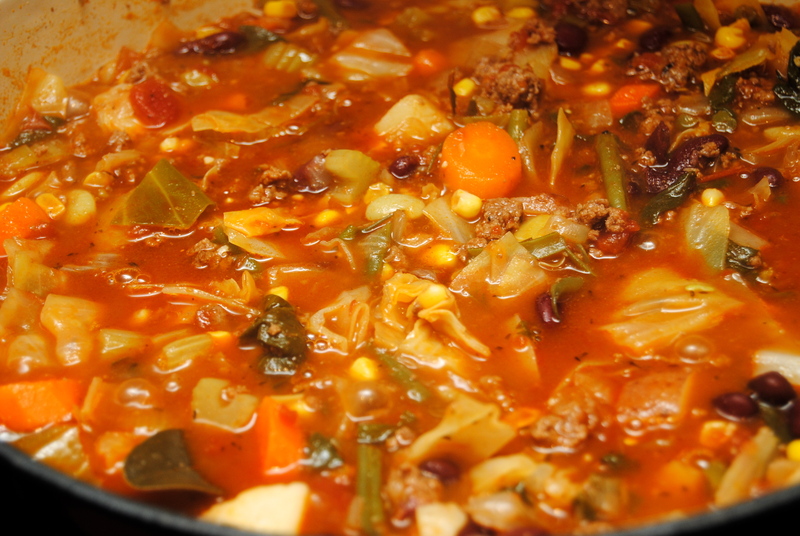 It adds such an awesome flavor to the soup that I simply will not make it if there is no cabbage. So take or leave any of the others, but I can’t promise the soup will be as good without the cabbage. Okay, I’ll get off my soap box. The soup takes about 30 minutes to prep/start and about an hour to simmer. 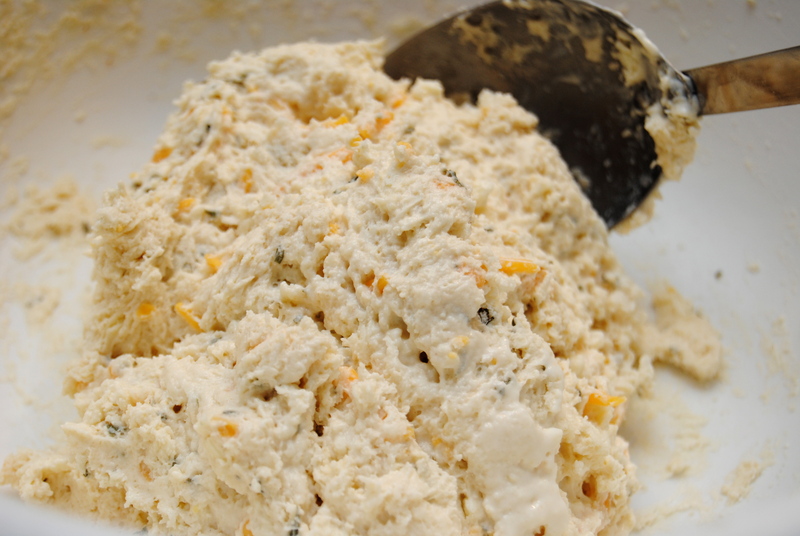 So as I was waiting impatiently for my soup to be done, I started day dreaming about what I could make to go with it… and then it occurred to me – garlic cheddar biscuits would be to die for with this soup. So I modified my ole buttermilk drop biscuit recipe with some garlic powder, onion powder, dried parsley and cheddar cheese. And oh my gosh these things are good. 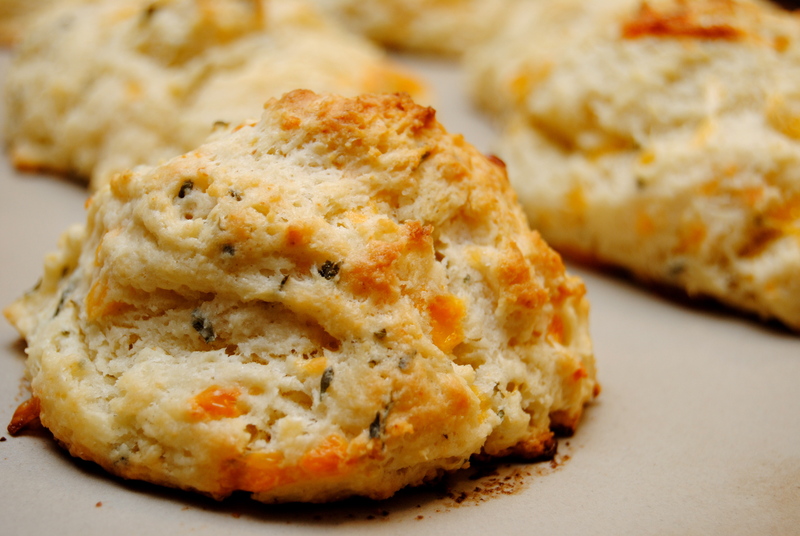 They’ve got a similar taste to Red Lobster’s cheddar biscuits. They were quick and easy and did turn out to be the perfect compliment to my soup. This made a huge pot of soup (I’m not great guestimating serving sizes), but you could easily freeze half and still have plenty to enjoy. 1.) 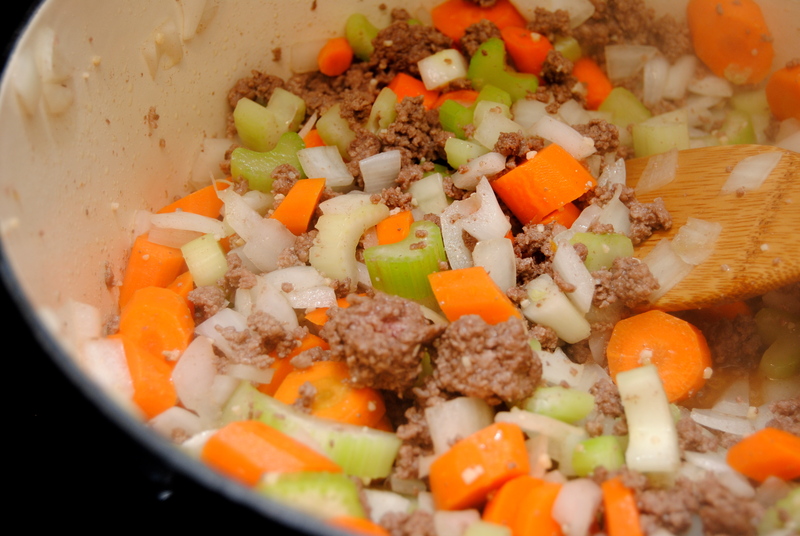 In a large dutch oven or soup pot, brown ground beef. Add onions, garlic, carrots, celery, salt and pepper and sauté until onions are translucent (about 5 minutes). 2.) Add tomatoes and beef broth and stir until well combined. Add remaining ingredients, stir and bring to boil. Reduce heat to medium-low and cover. Simmer for about an hour, stirring occasionally. Try it and add more salt and pepper to taste (I almost always need to add more salt). 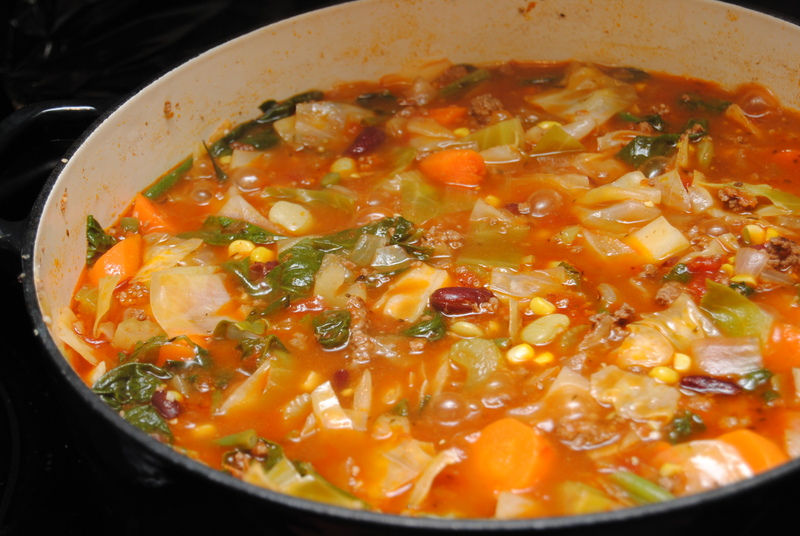 This is what the soup looks like when you first add all the veggies. This is after about 30 minutes of simmering. This is an hour after simmering. 2.) 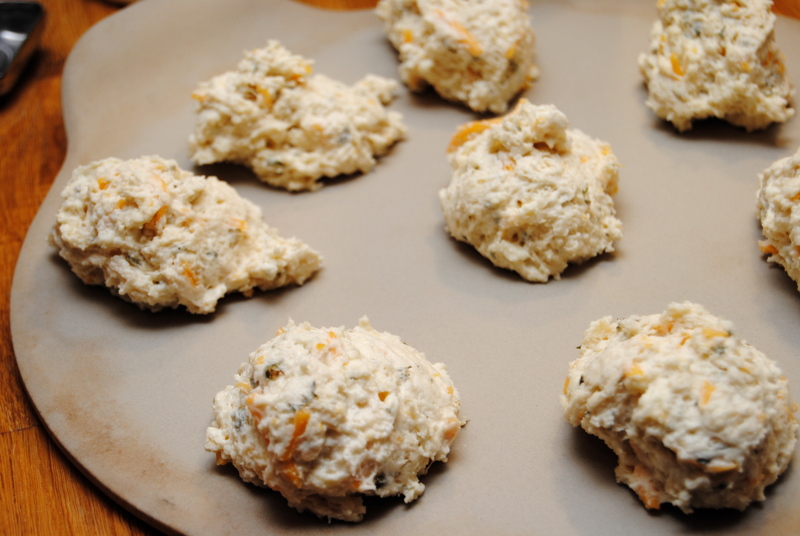 In a large bowl, combine flour, baking powder, baking soda, salt, garlic powder, onion powder and dried parsley. Stir with a whisk until well mixed. 3.) 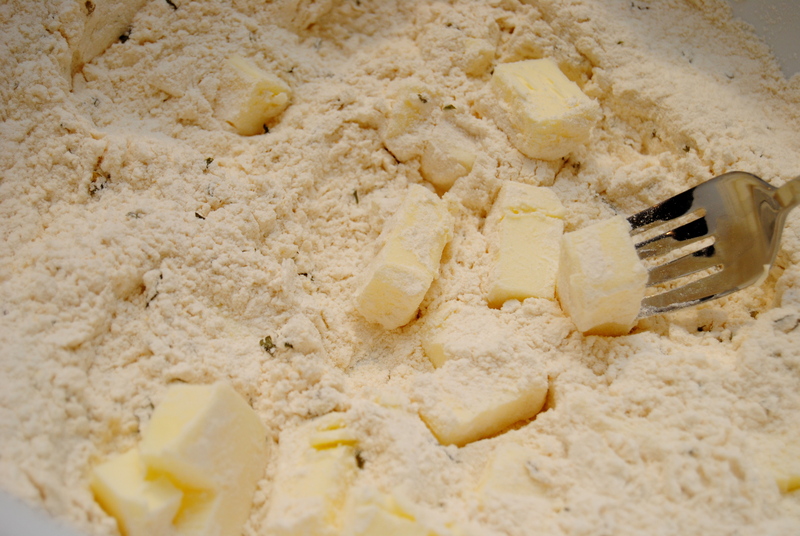 Add butter and cut with a pastry cutter until the flour resembles coarse meal. 4.) 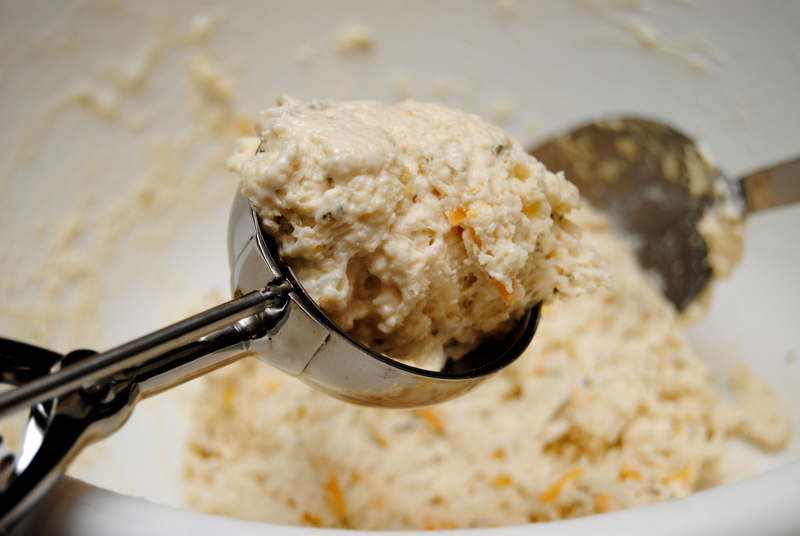 Add buttermilk and cheddar cheese and mix well with a large spoon. 5.) 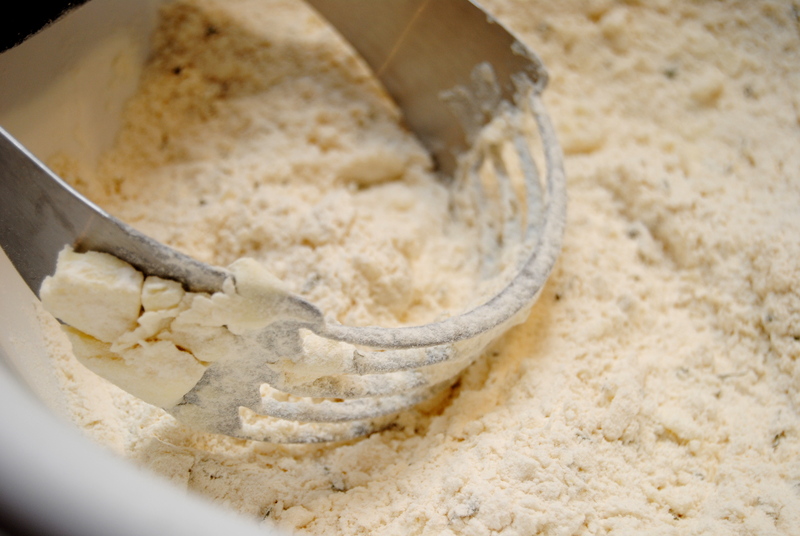 Using a scooper, scoop out the dough and drop onto a cooking stone. Bake for 12 to 14 minutes, or until the tops are golden brown. This recipe yielded me 10 large biscuits. 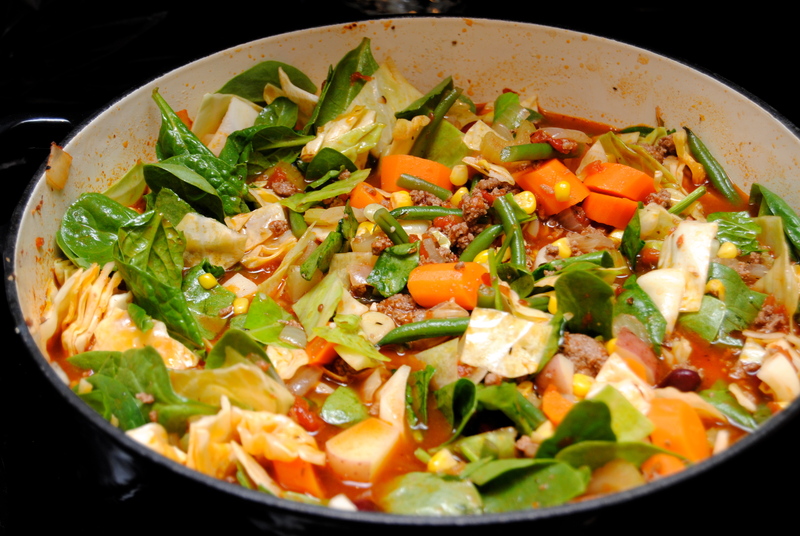 This entry was posted in Food and tagged Beef vegetable soup, Biscuits, Cabbage, Drop biscuits, Fall, Garlic cheddar biscuits, Soup, Vegetable soup by biscuitsncrazy. Bookmark the permalink. Reblogged this on CM mom to two boys.